England cricket coach Andy Flower has suggested that he may make some changes to his bowling line-up when they play their fourth Test in Melbourne. England slumped to a heavy 267-run defeat as they struggled to break down the Aussies in the Third Test. “A five-Test series is hard on everyone, both physically and emotionally. For the fast bowlers even more so, I would say,” Flower said. “We’ve got a few days now to reassess prior to Melbourne and the bottom line is we’ll pick the XI that we think will have the best chance of winning in Melbourne. Andy Flower is considering promoting Ian Bell up the order after Kevin Pietersen and Paul Collingwood have failed to deliver in the middle order. “We are always looking at ways to improve our side,” Flower said. 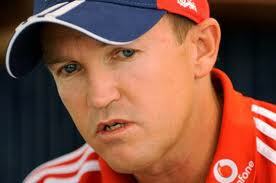 “Ian Bell looks in very good form, he’s very confident and he’s played beautifully throughout this tour.